Some light measurement applications require the light sensor to be installed within a measurement system or op-erated remotely. Industrial applica-tions often require integration with PLC systems. Continuous and remote operation requires light measurement sensors to be robust. For such tasks, Gigahertz-Optik offers the compact spectral light sensor CSS-45. It is a pre-cise spectroradiometer covering the wavelength range 360 nm to 830 nm. Spectroradiometer sensor with out-standing light measurement characteristic. Diffuser with a precise cosine adjust-ment (f2 ≤ 1.5 %) for measuring the illuminance and irradiance of extend-ed light sources and lighting equipment. The compact metal housing features an M6 threaded hole and a V-groove around the device for universal attachment of the CSS-45. The dimensions are given in the technical drawing avail-able for download. The housing with its splash-proof electrical connectors meets the requirements of protection class IP62. For IP65 rated protection, a sensor variant with glass dome is required. The instrument measures from 360 nm to 830 nm, thereby supporting the CIE spectral range for photometric measurements (ISO/CIE 19476). The spectral bandwidth is 10 nm which, in combination with the mathematical bandwidth correction according to CIE 214, provides a sufficiently high spectral resolution for most photometric and colorimetric applications. The illuminance measurement range is 1 lx to 350.000 lx, exceeding the performance of many other products. An absolute must-have for any array spectroradiometer is the ability to perform a dark current measurement for accuracy and to compensate for temperature influences. The CSS-45 sensor incorporates an electromechanical shutter for this purpose, which performs fully automatic dark current measurements when the operating temperature changes. The meter displays comprehensive radiometric, photometric and colorimetric quantities, all of which are derived from the measured spectrum. 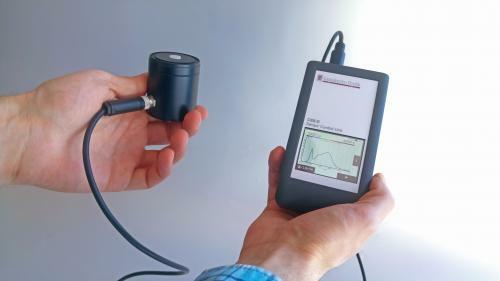 Many additional measurands expand the supported applications of the handheld spectroradiometer. They are described on the product page of sensor CSS-45. With its individual wavelength and linearity correction, the meter provides a cost effective solution for high precision light measurements, irrespective of the intensity or spectral distribution of the source. A key quality feature of Gigahertz-Optik’s light meters is their precise and traceable calibration. The calibration laboratory of Gigahertz-Optik GmbH guarantees the high quality and traceability of their factory calibrations. The calibration of the CSS-45 with CSS-D is confirmed by a factory calibration certificate.